When my Mom emailed me and expressed interest in trying out some fermented recipes from my blog it was like a hand vaulted out of my computer screen and slapped me in the face. For a moment, I didn’t know what the hell had just happened. I was stunned. 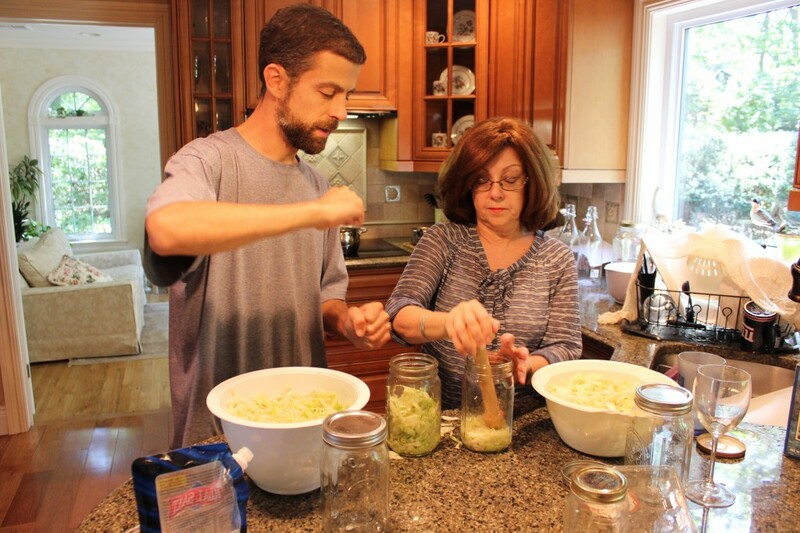 Because if you’re like me, getting your family interested in fermented foods is no small task. Let’s just say the world of traditional foods is a very different world to my family. Home fermentation whereby one has to leave food out at room temperature is just one small example. Others include eating butter, lard, making real bone stocks and drinking raw milk. I grew up on Long Island and these foods were widely demonized or in the case of fermented foods, replaced by cheap, imitation store-bought versions. Nobody and I mean ABSOLUTELY NOBODY made their own sauerkraut or pickles when I was growing up. My only recollection of sauerkraut was some gross stringy crap that came out of cans. I could never understand why people chose to ruin their hot dogs with that stuff. And pickles? Well I LOVED pickles. Or at least I thought I did. Because the only pickles I knew growing up were Vlasic. I didn’t realize until my mid-30s that Vlasic pickles are the fake imitation versions of real fermented pickles. If that’s the first time you’ve heard that, trust me, it’s painful to me as well. Even though I don’t eat them anymore, I will always love Vlasic pickles. Of course, canned sauerkraut and fake pickles are just the tip of the iceberg when it comes to the processed convenience foods that have replaced their real, traditional versions. But the good news is that little by little, the real food movement is waking people up. The spread of farmers markets, local and organic foods and real food blogs, books and documentaries are shifting our awareness back to real food. And even though my blog occupies only a tiny little space in the real food blogosphere, I know it’s having an impact. People write me all the time with questions and comments. But to me personally, there’s no better example of that than the pictures that follow. 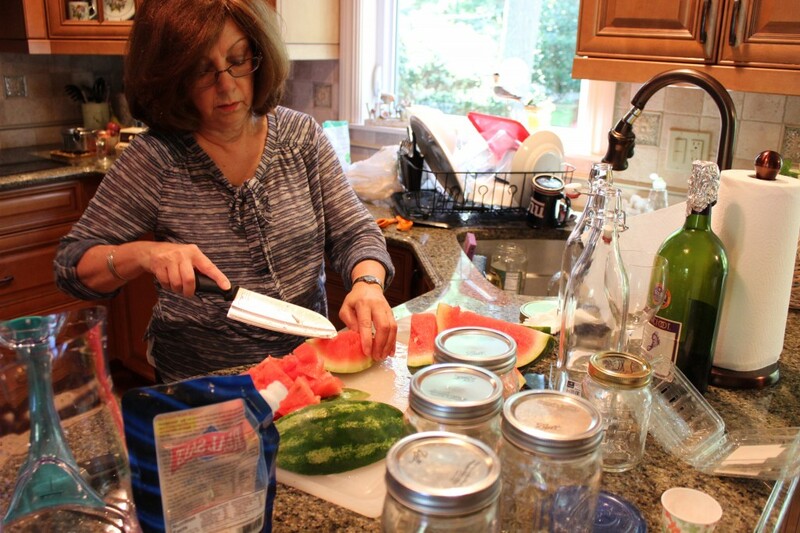 This past weekend I came home to Long Island for a visit and my Mom and I spent an afternoon making some fermented foods. Not bad for about an hour’s worth of work. 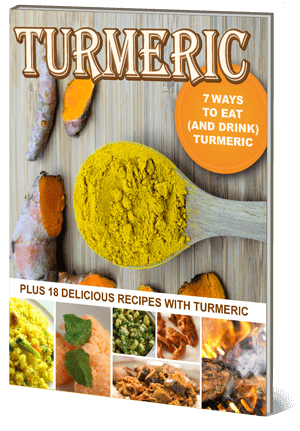 Maybe you also have friends or family that are interested in fermented foods but don’t know where to start? Forget the beet kvass and kombucha for now. Want to wow ‘em and hook ‘em right from the get-go? 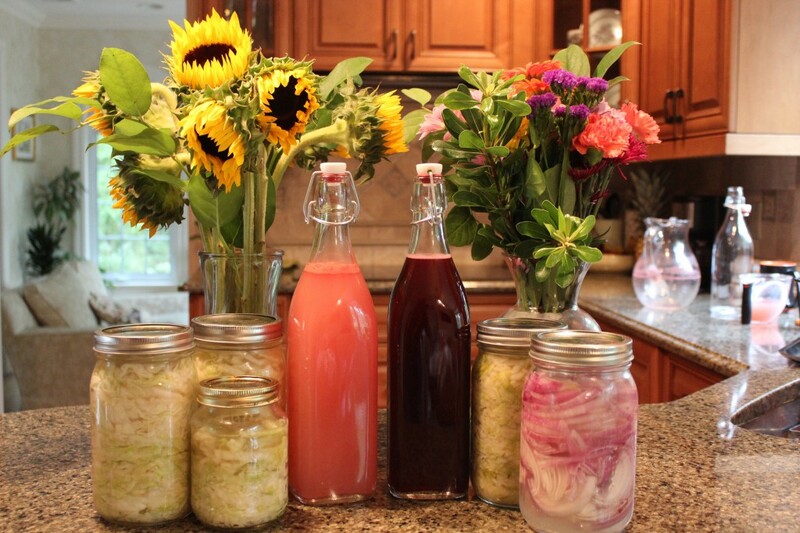 Want to get kids excited about lacto-fermentation? Make lacto-fermented soda from real fruit. Never made lacto-fermented soda? Neither had I until recently. It’s so easy. All you need is fruit, sugar and a starter culture. Check out my post for how to make lacto-fermented blueberry soda. And here’s the post for how to make watermelon soda. Starting out with some super spicy exotic Asian recipe that you need to ferment in a hole in the ground for 8 weeks is probably not the best starting point. Start with a simple fermented vegetable that requires only a simple brine. Brining is just adding salt and water to a vegetable. Pickles are a perfect example. All you do is add cucumber spears to salt water with some herbs and spices. 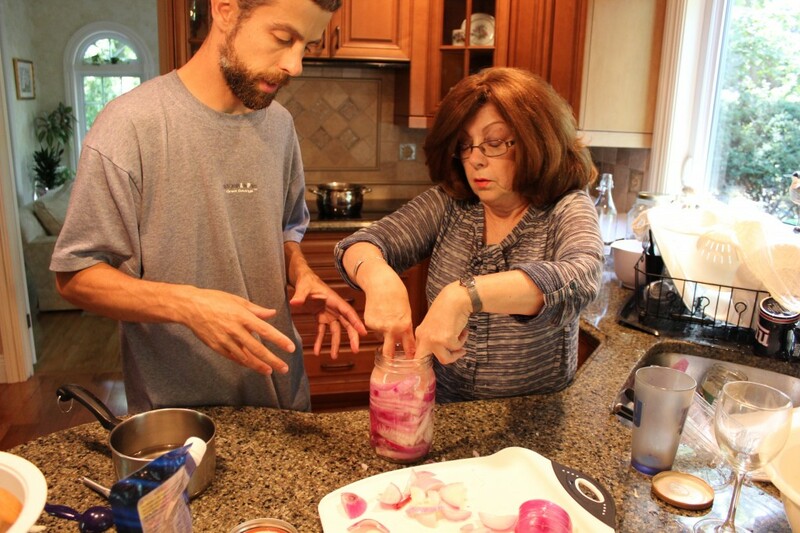 My Mom and I did red onions together and it took all of about 5 minutes to chop the onions and add the salt and water. You can check out my posts for how to make lacto-fermented pickles and lacto-fermented red onions. I know not everyone loves sauerkraut but most people are amazed at the difference in taste between the canned crap we all grew up on and the real thing. My Mom and I made what I call “easy speasy” sauerkraut which requires very little pounding and pressing of the cabbage. You can check out my guest post recipe over at Primally Inspired. Of course, the last person your family will listen to is you. So don’t think you’re going to get them interested in fermented foods on your own. You can scream and rant, proselytize and preach, but they probably won’t listen. But they might listen to a celebrity. Like Dr. Oz. Now I’m not a big fan of Dr. Oz but for better or worse, people listen to him. And despite the fact that he can’t even pronounce the word “kombucha,” this video is a decent introduction into the benefits of real fermented foods. They even explained why store-bought pickles are fake! For a more thorough explanation of the difference between conventional store-bought pickles and real pickles, check out my recent blog post where I compare the ingredients label of two pickle companies. Chances are someone in your family has heartburn, GERD, IBS, Crohn’s disease, ulcerative colitis or one of the dozens of commonly diagnosed digestive disorders. It’s crazy how many people suffer with digestive problems today. And it’s even crazier how simple it can be to improve digestive issues with a few simple dietary changes. Well, real fermented foods are just one example. Of course, they probably won’t listen to you. Well I’m no celebrity but what I do have going for me is that I’m not a member of your family. So there’s a fighting chance they might listen to me. Unlike Dr. Oz, I know how to pronounce it.